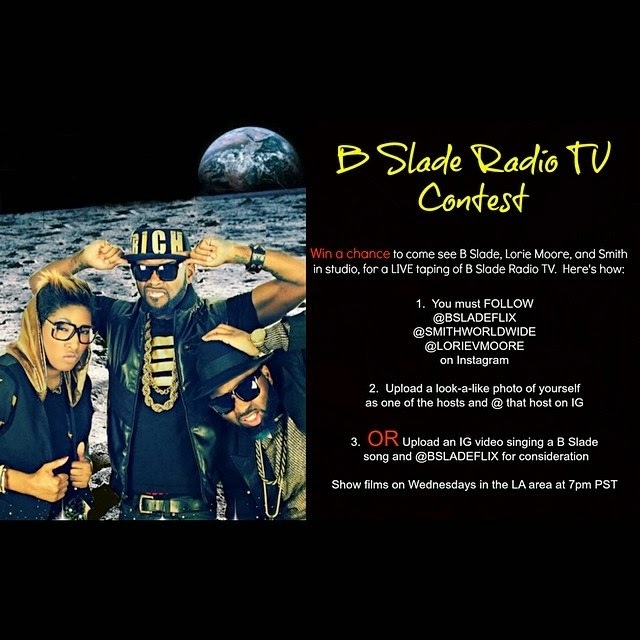 "B.Slade Radio TV", which airs LIVE every Wednesday from 7-8 pm PST on RMCONLIVE.COM. Simply follow @BSLADEFLIX, @SMITHWORLDWIDE and @LORIEVMOORE (all 3) on Instagram and either upload a look-alike photo of yourself as one of the hosts on Instagram, AND @ them. Alternatively, upload a video on Instagram of you singing a song by B.Slade and @BSLADEFLIX on Instagram for consideration. "B.Slade Radio TV" films in the Los Angeles area. So GET YOUR VIDEOS OR PICS IN NOW!